Watch our canine therapists work their magic! 'Dr Paws, a short documentary about our Angels at work has won the 1st price at WeCare, a United Nations film festival. It has also been awarded the best film at the Script Film Festival in Cochin and at the International Film Festival in Kerala. Rohini and Radhika were nominated as MTV Youth Icons of the year 2008 for their work at Animal Angels Foundation. They were also nominated for the TATA NEN Startups Awards 2008. Our organization was ranked 241 from 600 different startup companies in India! We were chosen for the Paragon 100 Fellowship (2009-2010) organised by The Foundation for Youth Social Entrepreneurship (FYSE). Rohini and Radhika were part of 100 young outstanding social change makers and entrepreneurs chosen from the Asia Pacific region. Animal Angels Foundation is a Mumbai based organization founded by Rohini Fernandes and Radhika Nair who are clinical psychologists, certified practitioners of animal-assisted therapy and professional dog trainers. 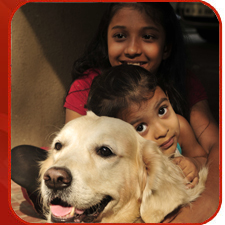 Animal Angels Foundation is the first organization in India working in the field of animal-assisted therapy. Through animal-assisted therapy, our specially trained therapy pets assist us in helping children and adults learn or improve various skills and in speeding up the recovery process. We practice animal-assisted therapy in the areas of developmental disorders, psychiatric disorders, physical disabilities, physical illnesses and behavioural/emotional problems.